It all began with Tom Nechville's dream: a better banjo. He would spend more time tweaking and setting up the instrument than actually playing it. He believed in a better way. Then it hit him: he would create a banjo that held even tension all the way around the head- with a mason jar like tightening system. This became our patented Heli-Mount frame, which allows easy, quick and simple adjustments. The Heli-Mount frame has been the staple of our product line for over 30 years. The sound of a perfectly tensioned banjo head is remarkable: rich, deep, and sweet. The time spent changing the head transformed from an all afternoon event to a two minute spin. Since that time in the late 1980's, he has made many other improvements to the banjo. These include an adjustable and removable neck connection that negates the need for coordinator rods. Also a compensated bridge, wooden armrest and radiused fingerboard. These are modern conveniences not traditionally found on the instrument. The result is cleaner sound and easy adjustment. 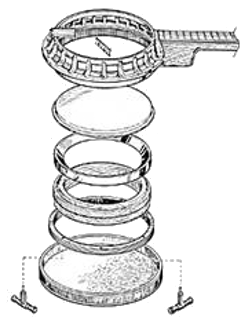 Similar in operation to a jar lid, the Heli-Mount system produces even tension throughout the banjo head. This takes place in a matter of minutes rather than in an all-day project! Tightening or loosening the Heli-Mount banjo head is accomplished by turning a single threaded tensioning ring which fits inside the Heli-Mount frame. 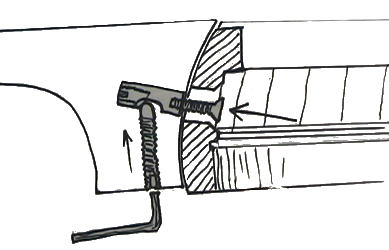 Adjustments are made by rotating two Heli-Mount tensioning wrenches that plug into the back side of the tensioning ring. Nechville Musical Products' revolutionary (see what we did there?) one-piece cast metal Heli-Mount banjo frame replaces over seventy miscellaneous pieces of hardware used in the construction of conventional hook-and-nut style banjos. 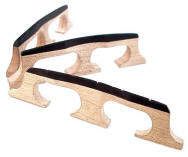 While regular banjos do not have effective neck angle adjustments, Nechville necks are easily adjusted for low or high bridges, without the need to remove resonator. This is without any stress to the heel of the neck and tone components (tone ring, rim and head) of the banjo. 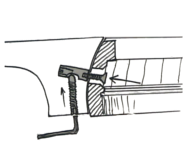 A solid connection between the neck and the body of the banjo is crucial to the sound of a banjo. A regular hook style banjo has a narrow heel and only connected in two relatively small areas, the Nechville neck heel is wider and intimately mated to the body of the instrument for a more solid feel. This translates into a banjo that stays in tune, can be played harder without overdriving it and has plenty of sustain. Our Cyclotronic (ball bearing) system is standard on all of our Heli-Mount models and has several benefits. 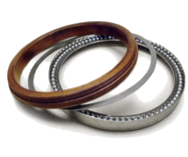 The system is a set of bearings and a bearing race that interface between the tone ring (wood or metal) and the wood rim. It keeps the tone ring stationary while the head is tightened. The result is a more pleasing harmonic sustain and a seamless interface that allows sound to be spread to our three ply maple ring. Say goodbye to frustrations from poor intonation, clammy metal armrests, stiff tailpieces, cracked lacquer or finishes. Shaped by hand with close attention to grain orientation, composition and weight. Compensated for proper intonation all the way up the neck!